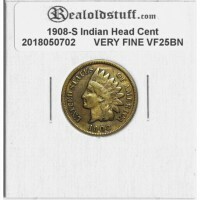 This is a very nice example of the 1908-S Indian Cent from the San Francisco Mint in Very Fine condition. An even brown in color both obverse and reverse and problem free. This will be an admirable addition to any Indian Cent collection.